The BSA Venture Crew 820 and the GLSPS are inviting divers of all ages to join us in a very worthy cause. To help cleanup the beach at Lake Phalen. This is an annual event. Please join us in keeping our city lakes clean of trash and debris. Please contact Dean Soderbeck if you are interested. Contact information is below. We hope to see lots of you there!! 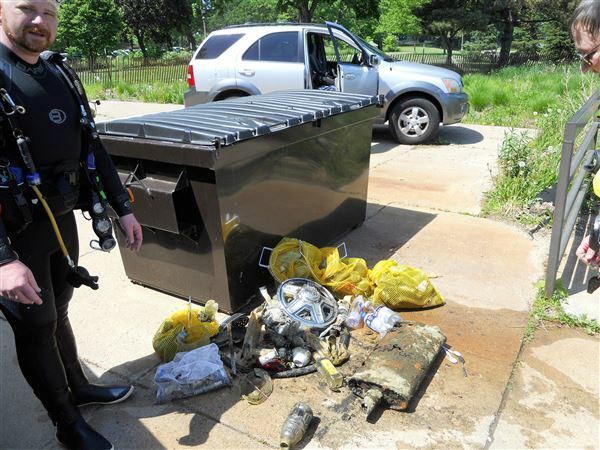 Divers from all around the Twin Cities helped with the 8th annual BSA Scuba Venture Crew 820’s ‘Underwater Beach Clean-up’ event Saturday May 26th, 2018. Venture Crew 820 hosted the event and provided free air tanks to all the divers plus outfitted 12 divers with all of their dive equipment needs, as well as provided lunch to all the volunteers. A total of 32 volunteers participated in this event with GLSPS, including 19 BSA Venture Crew members and 5 GLSPS members. Some of the volunteers that dove with us saw an article on the event and wanted to simultaneously help out and get their first dive in. Of the 21 divers, 3 SSI Open Water Dive Instructors, 2 PADI Dive Masters, and 2 PADI Master Divers participated. One of the Master Divers was only 15-years old and has been diving and a member of BSA Venture Crew 820 since he was 12-years old. With so many volunteers, the cleanup went quickly. Divers spent an average of 24 minutes under the chilly 42 degree water depending on the depth of their zone they were covering. Seven youth and five adult divers from BSA Scuba Venture Crew 820 teamed up with five divers from the Great Lakes Shipwreck Preservation Society (GLSPS), three divers from Northland Scuba, and divers from Scuba Squad, MN Scuba club, and divers who wanted to assist. We had additional volunteers cleaning up the shallow knee deep water and other non divers cleaned up the beach front area or served as shore support. The volunteers found the majority of debris in the shallow water and out in the 20-foot depth area, including: glass, pop & beer cans, plastic bags, lids, containers, sun glasses, a dive fin, dive mask, golf balls, fishing reel, monofilament fishing line, commercial light fixture, car tires & a muffler, hub caps, a large picnic table that we dragged up to shallower water, and other lost items from either last summer’s swim season or items left on the ice during the winter. With the ice just leaving the lake 4 weeks earlier, the divers had cold water wet suits, dry suits, hoods, and gloves on to keep warm at the cold water temperatures found 15 to 18 feet down or deeper. Saturday May 26 had a record high temperature that reached 96 degrees, so when the divers suited up in their cold water dive equipment, they just wanted to get into the lake to cool off. What other sport can you go from heat exhaustion to hypothermia in a matter of minutes? The surface water was between 68 and 72 degrees but it quickly cooled off the deeper you went. At 15 to 18 feet down, the average water temperature was 55 to 59 degrees, and some divers went down below 28 feet with water temperatures dropping to 43 degrees. We had two areas around the lake that needed underwater clean-up this year, so after lunch 3 divers and one shore support adult spent an average of 30 minutes underwater each covering a 300 foot by 30 foot area in front of the Phalen Lakeside Activity Center. We removed more debris in a smaller area off the T-dock and promenade deck than the large area in front of the public swim beach house. Besides picking up debris, the divers also assisted the City of St. Paul by searching for a sail boat rudder and center board that was thrown off a moored vessel earlier in the week. KSTP channel 5 News, WCCO channel 4 News, and Saint Paul Pioneer Press covered the event this year which is always a treat. We made a lot of new diving friends at this event and hope to dive with many of them this summer at some of the fun quarry dives at Ore-B-Gone, or shipwreck dives in Lake Superior with GLSPS. 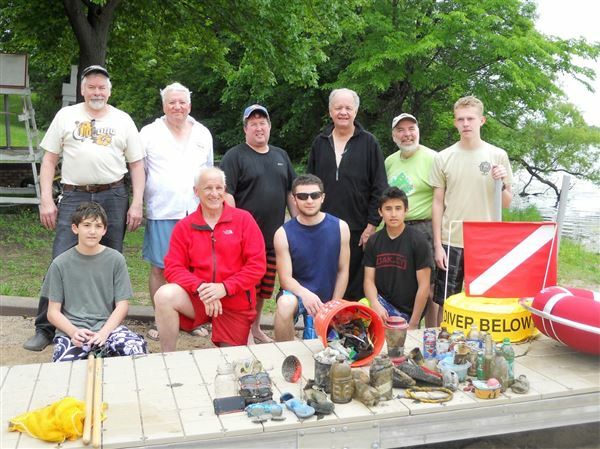 For the past three years the GLSPS has joined in collaboration with the BSA Venture Crew 820 Youth Group to help / assist in the Lake Phalen Beach Cleanup Dives and also helps promote the BSA Youth Programs. Thank you to all that participated in the Beach Cleanup on Lake Phalen! We hope you join us again next year and invite a dive buddy!